For casual blog content on this site, peruse the “Hey Sara” category above. Below is a list of articles, stories, and poems I have had published on the world wide web or in print. Cheers. 02.06.19 – Outdoor Prolink Blog – Amateurs on the loose: The allure of chasing FKTs. Wherein I give my take on why amateurs and professionals alike are drawn to the Fastest Known Time playing field. 10.02.18 – Outdoor Prolink Blog – Friends, Feats, and The Subtle Mentor: Emma Murry joins Sunny Stroeer on the Hayduke Trail for a difficult section through The Grand Canyon. Despite being a decade apart in age, their bond and ability to learn from one another is what helps nurture a successful mentorship. 09.13.18 – Outdoor Prolink Blog – Yosemite’s annual Facelift has become a golden child of stewardship: Every year the Yosemite Climbing Association hosts the largest clean-up event of any National Park. Since it’s inception, over a million pounds of trash and abandoned infrastructure has been removed. 07.27.18 – The Climbing Zine – Love Letter to Climbing: During the International Climber’s Festival Luke Mehall hosted a love letter writing contest on the official Zine typewriter. My poem was selected as the winner. 07.23.18 – Alpinist Magazine – Responsibility is a Gift: OR trade show provides a glimpse of outdoor industry’s impacts and influence: Co-authored with Emma Murray, we attended the January, newly-conjoined tradeshow and SIA Snow Show in Denver to investigate the industry’s current stance on climate change. 04.22.18 – Outdoor Prolink Blog – Why We Should Adopt Leave No Trave Ethics to Everyday Life: Happy Earth Day! Let’s take care of our planet and truly internalize what we preach. 02.19.18 – Outdoor Prolink Blog – How Dirtbags Make Money: Those who pursue passion lifestyles typically treat money as a means to an end, exploring seasonal work, sporadic gigs, or the producing and selling of hats and stickers in order to fund adventure. But the question of “how” becomes more about how they manage to make the money last, which, in true dirtbag fashion, is the art of living below your means. 08.23.17 – Alpinist Magazine – Outdoor Retailer Summer Show: Diversity and Inclusion; Where the outdoor industry’s mega-convention does (and doesn’t) succeed. Co-authored with Emma Murray, we attended the Summer Show to ask those difficult questions and foster dialogue regarding the perceived masculine dominance over the industry; to see if there’s measurable efforts to include and create level ground for people of color and other marginalized groups (particularly in business practices); and to partake in the Public Lands march. 07.07.17 – Misadventures Magazine – A Woman Beneath the Moon: My account of a solo trail-run of the High Sierra camp loop in Yosemite National Park over 2.5 days in 2014. 04.25.2017 – Terra Incognita Media – Mother of My Dreams: A meditation on a series of dreams of my mother, who passed away in 2009, and how her death could be a glimpse into my own. 09.29.2016 – Outdoor Prolink Blog – A Climber Wedding on the Incredible Hulk: A summary of what it took to put together a climbing wedding in the Sierra Nevada, from meeting our officiant at Camp 4 to the gear we used and the food we dished up. Photography by Cheyne Lempe. 04.26.2016 – Mountain Standard Blog – Chasing Shade in the Sierra. A recap of a fun-hog weekend for Mountain Standard’s spring “Desert Dream Season.” Video on YouTube. 04.26.2016 – Outdoor Prolink Blog – Why Dirtbags Love Stickers. A fun look at why those who thrive outside love stickers so much. 02.29.2016 – Outdoor Prolink Blog – Winter Running Tips from IronMan endurance athlete Ariana Schiff. 02.11.2016 – Becoming Infinity Blog – 5 Ideas for an #OPTOutside Valentine’s Day. From cross-country skiing to even a simple day hike, here’s 5 ideas for a romantic and nature-filled getaway. 10.01.2015 – Outdoor Prolink Blog – Banana Protein Pancakes, Camp Recipe. A different way to treat yourself before a big day at the crag or a trek up the hill. 09.16.2015 – Outdoor Prolink Blog – Rising From the Dust: A Free Solo Accident. The story of climber and runner Alain DeLa Tejera, who fell free-soloing in New Jack City, CA. Listen to an interview on SoundCloud (discretion is advised). 08.31.2015 – Outdoor Prolink Blog – Channeling the Weekend Warrior. My account on working as talent in a Subaru car commercial. Watch the commercial here. 01.07.2016 – Outdoor Prolink Blog – 12 Winter Workouts for Climbers. Stay in peak shape with these 12 climbing-conscious workouts. 11.30.2015 – Outdoor Prolink Blog – The Spirit of Joshua Tree. 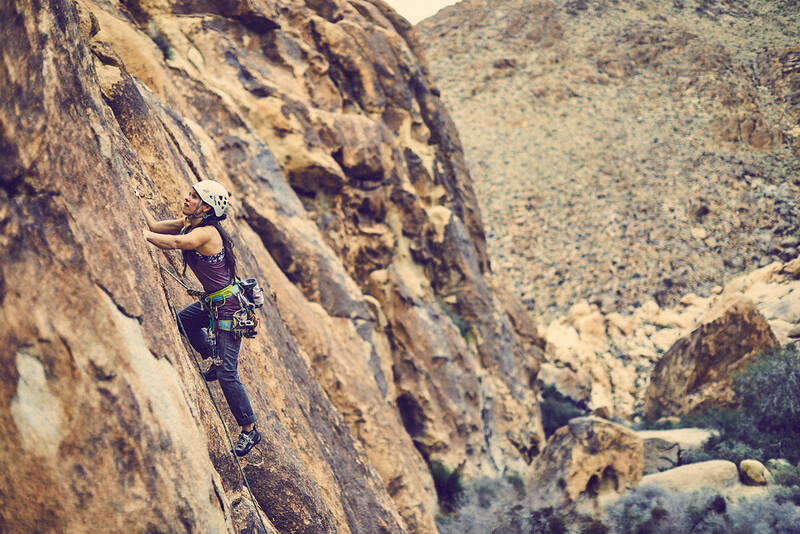 A dive into the climbing culture and history of the remarkable Joshua Tree National Park. 08.05.2015 – Outdoor Prolink Blog – Thoughts on Solitude. Some musings over solitude and how empowering it can be. 07.01.2015 – Outdoor Prolink Blog – Pros of the Dirtbag Lifestyle. I take a look at the many pluses for living the dirtbag way. 06.09.2015 – Outdoor Prolink Blog – Failed Love on the Pacific Crest Trail. My own personal account of jumping on the trail with a significant other and having the relationship fall to pieces over 40 days. I trend toward depression, but then find myself moving to Boulder, CO where I meet my future husband. 05.07.2015 – Outdoor Prolink Blog – Climbing Masochism. Climbers seem to revel in pain, especially the type that makes us stronger. 04.14.2015 – Outdoor Prolink Blog – Climbing at the Creek. The account of my first visit ever to Indian Creek, alone and afraid, and what it taught me. 05. 24.2017 – She-Explores – Podcast Episode 29: Finding Balance in the Hustle. 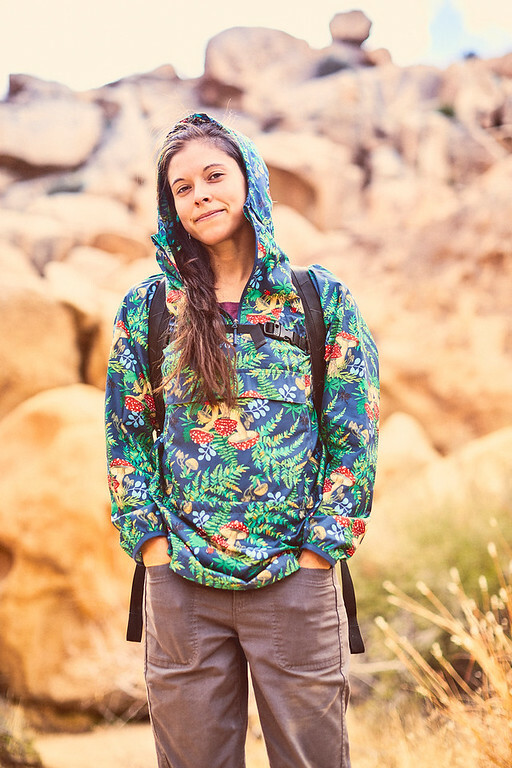 Before the interview with OutdoorFest and Mappy Hour founder Sarah Knapp, Gale Straub features a recording I submitted in response to Episode 23: Mental Health & The Outdoors. I briefly speak about anxiety and depression from the perspective of losing a parent to genetic breast cancer and how inheriting the same mutation has influenced my life. 05.02.2016 – Outdoor Prolink Blog – 2016 Yosemite Climbing Guide Book and interview with Erik Sloan. A brief overview of the new climbing guide book published for Yosemite National Park, with video by AFU Studios. 04.07.2015 – Outdoor Prolink Blog – A Dirtbag Dreamer: Matt Myers. An interview with the owner and founder of Hostel California in Bishop, CA. 04.24.2017 – Outdoor Prolink Blog – ProView: Outdoor Research Gauge Tee and Trucker Hat: From the new technical line of trucker hats, which my husband steals, to the new Gauge short sleeve running tee, Outdoor Research has redefined comfort and utility in standard endurance items. 09.21.2016 – Outdoor Prolink Blog – ProView: MountainSmith Wizard 30L. A gear review on the MountainSmith Wizard 30L Pack. 07.08.2016 – Outdoor Prolink Blog – ProView: SPY Optic Allure Sunglasses. A gear review on the SPY Optic Allure Sunglasses with Happy Lens. 06.23.2016 – Outdoor Prolink Blog – ProView: Petzl Elia Climbing Helmet. A gear review on the new version of the Petzl Elia women’s climbing helmet. 05.31.2016 – Outdoor Prolink Blog – ProView: Scarpa Neutron & Atom Trail Runners. A gear review and comparison between the Scarpa Neutron and Scarpa Atom trail runners. 05.04.2016 – Outdoor Prolink Blog – ProView: Pearl Izumi N3 Trail Runners. A gear review on the new Pearl Izumi N3 women’s trail runners. 03.30.2016 – Outdoor Prolink Blog – ProView: Gregory I-Street Waterproof 30L Pack. A gear review on the waterproof and laptop carrying commuter pack by Gregory. 02.05.2016 – Outdoor Prolink Blog – ProView: MSR Lightning Ascent Women’s Snowshoe. A gear review on the new MSR ultralight women’s snowshoe. 10.19.2015 – Outdoor Prolink Blog – ProView: Petzl Connect and Dual Connect Adjust. A gear review and comparison of the innovative Connect and Dual Connect Adjust by Petzl. 08.26.2015 – Outdoor Prolink Blog – ProView: 5.10 Anasazi LV Climbing Shoe. A gear review on the women’s 5.10 Anasazi LV shoe. 07.15.2015 – Outdoor Prolink Blog – ProView: Osprey Rev 12 Pack. A gear review on the ultralight and ultra-handy hydration pack by Osprey. 05.12.2015 – Outdoor Prolink Blog – ProView: Petzl Hirundos Harness. A gear review of the new and ultralight Hirundos harness by Petzl. Sara climbing in Joshua Tree. Photo: Clayton Boyd.